On Wednesday, the White House announced a long-awaited plan to reduce methane emissions from the oil and natural gas sector, with the goal of slashing methane from new and modified oil and gas processing and production facilities by up to 45 percent from 2012 levels by 2025. The administration directed EPA and other agencies to develop rules to meet its goal. President Obama’s methane scheme is an attempt to fix a problem that does not exist. Energy producers have an economic incentive to prevent natural gas leaks: methane (the major component of natural gas) is a valuable commodity that provides heating and electricity to millions of American families and serves as a vital feedstock for chemical and manufacturing companies. As a result, methane emissions are declining even as oil and gas production is booming—all without federal intervention. Any federal rules to tackle our non-existent methane problem will only complicate existing industry-led efforts, resulting in less domestic energy production and thus higher energy costs for American families. Even more impressive is that energy producers are reducing methane emissions even as energy production is booming. 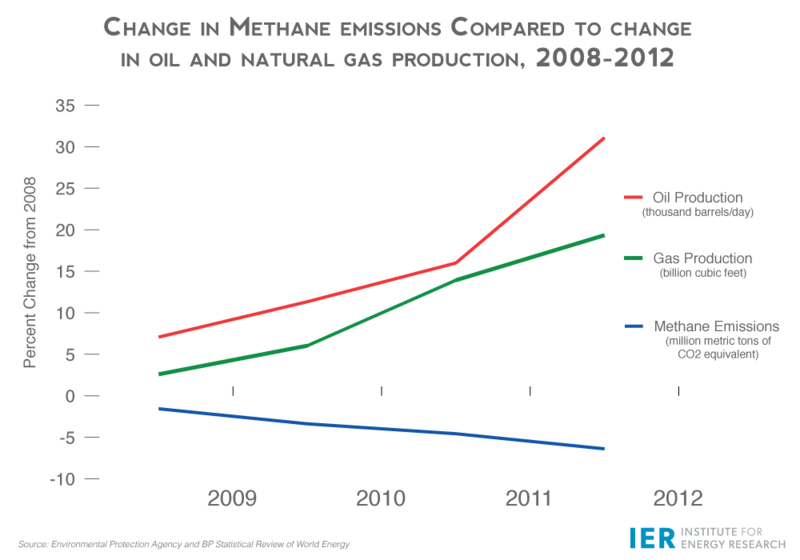 The following chart shows the percent change in U.S. oil and gas production since 2008 compared to U.S. methane emissions. These emission reductions didn’t happen by accident—and especially not due to federal regulation. Energy producers had an incentive to reduce waste, so they developed innovative ways to capture more methane, thus lowering emissions even as production soared. Methane is an energy and environmental success story. It shows how energy producers can balance energy development with environmental protection, all without federal intervention. In the midst of a massive production boom that has made the U.S. the top combined oil and gas producer in the world, we are still managing to reduce emissions and protect our environment for future generations. It’s a testament to the ingenuity of America’s energy producers and a rebuke of the Obama administration’s attempts to mess with success. Instead of trying to fix what isn’t broken, the president should step aside and let America thrive.